The project DNA tests results by individual sorted into subgroups are on the DNA Results web page. These subgroups follow the order and sequence of FTDNA's haplotree. Map of frequencies in Europe during the modern era, based on current academic studies and charted by Eupedia.com. An overview of the early and major branches. 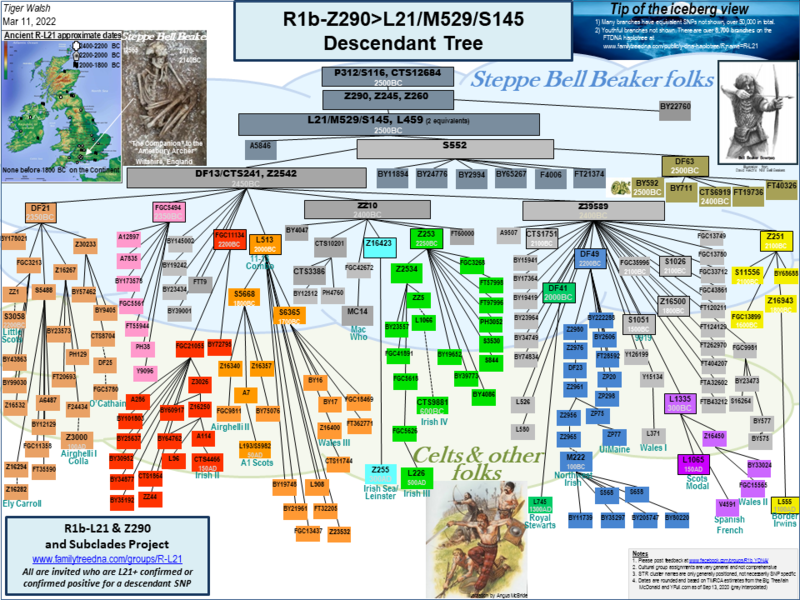 This is a high level descendant type tree mapped against a world history timeline, charted by Dave Vance. FTDNA's full haplotree with thousands of branches for L21 & Z290 is maintained in this PDF file. There are thousands of additional SNPs that are phylogenetic equivalents to the lead SNPs marking the branches in the outline tree. The complete list of SNPs with the position number, allele change and synonym details is included in this PDF file. The 67 and 111 STR length haplotypes from this project and some of the sub-projects are included in this spreadsheet. The spreadsheet can calculate Genetic Distances to anybody else in the spreadsheet from a single target individual. Various summaries, subtotals and statistical calculations are built in to the spreadsheet. If you want to be included in this spreadsheet, please join the project and upgrade to 67 or 111 STRs. 111 STRs is now the standard. Please go to the project Activity Feed's first post to get the file. The R1b-L21-project yahoo group is set to answer questions about the file or any of the data pertinent to R1b-Z290 and L21. The deep ancestry of R1b-L21 people is linked to ancient people called Indo-Europeans that came into Western and Central Europe during the Bronze Age. By the time descendants of the early Indo-Europeans reached Western Europe they became a part of The Beaker Folks. Archaeologically, they are associated with a bell shaped pottery, but there were many more items in the Bell Beaker package, including horse riding, archery, jewelry, specific burial patterns in mounds, bronze tools and weapons. The sketch below is by B. Richter. The British Isles transitioned from the Bell Beaker cultures of the early Bronze Age to a network of trade and exchange called the Atlantic Bronze Age. During this period of time it is believed that groups of people formed that might be considered Celtic. By the end of the Bronze Age Celtic tribes were spread all over Western Europe. The Celtic tribe maps below are derived from the reports of the Greeks and the Romans during the Classical time period. Please see the Ancestral Journeys web site developed by "Blood of the Celts" author Jean Manco. Overlay of later Celtic territories (dashed lines) on top of the earlier Bell Beaker territories.